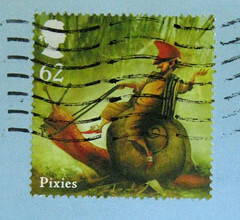 Mail artists and letter-writers are a generous lot, and I have sent and received many fine gifts to and from pen pals. I appreciate the spirit of giving in serendipity - not for birthdays, not for Christmas or some other gift-required occasion, but "just because." ...and she referenced this photo of him as one of the inspirations. Ain't it the spitting image?? I was so verklempt when I unwrapped this that I actually teared up and wept a bit, and that is because Memo is not in the best of health these days. When the stamp arrived, we thought he was descending further into kidney failure. (No joke, he's had "six months to live" for the past 4 years.) The day before we went away on our many-days holiday whirlwind trip, he was convulsing and we took him to a very expensive Sunday morning emergency vet appointment, bracing ourselves for the worst and prepared to put him down. However, it wasn't kidney failure, it was a combination of (unrelated?) 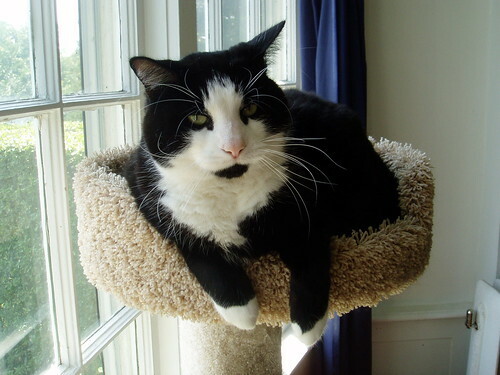 a bladder infection and feline diabetes. Because he needed constant monitoring, we had to board him at the vet while we were away ($$$$!!!). 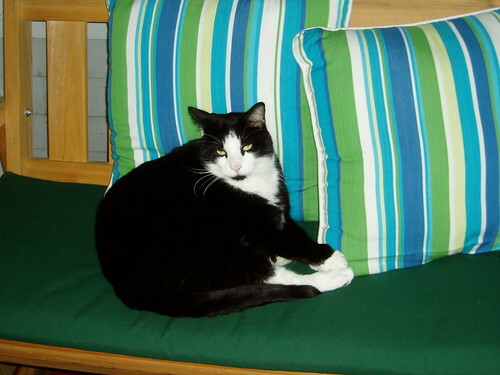 He is back home now, and I'm becoming a pro at giving my fat cat twice-daily injections of human insulin. Surreal. But he's doing much better now, and no longer seems to be at death's door. But what an amazing gift Carroll has given me, Memo forever embodied in a stamp. I am absolutely touched beyond words, and stamping Memo all over everything. He is gracing quite a lot of my outgoing mail these days - you might see Memo guarding mail on a future letter to you! So lovely piece of art! I think rubber stamps are cool, esp. handmade. This is indeed a beautiful gift. The stamp is a fantastic likeness of Memo. I love that Carroll did this just for the love of creating, too. And hugs for Memo. I'm glad to hear he is feeling better, and that you are getting good at the insulin shots. I suspect we are heading down a similar road with our elderly cat. Oh, hugs sweet Memo. Wishing him good health. The stamp is really awesome, what a kind and generous gesture. Carroll is indeed amazing and this is absolutely heartwarming. She really appears to have captured the essence of Memo. Incredible! Such a touching story! Maya and I send Memo much love. I worry that Maya will be in the same situation one day. I tell myself that she is very happy right now and much happier than she may have been if I hadn't adopted her from the shelter. I love the stamp from Carroll. I want to make a stamp of Maya but my carving skills aren't so advanced. You know, we have never exchanged mail. I will send you a postcard when I make something that I think that you will like. What an amazing stamp! I really like it! It must have been a wonderful surprise to receive it! Regards and hugs to Memo! 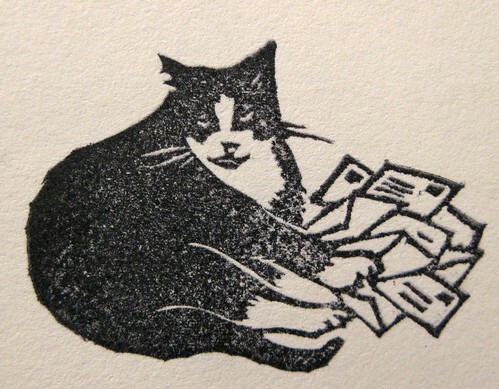 What a perfect stamper for you, with your beloved kitty surrounded by all the mail. And the package that it arrived in -- WOW! Carroll is so talented! getting anything from you with that stamp on it would make it even more special! Glad to hear that Memo's doing better! hope you're well as well!